Many people build a boat in their garden and some make the mistake of not being able to get it out! This is not the case for Phil Glover of the Humber LEP as this boat has its birth at the bottom of the garden. So why. Phil takes up the story. 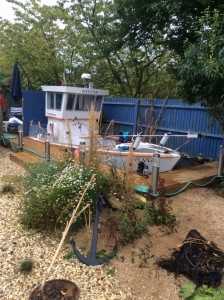 ” I have had a long time interest with the coast and sailing so when my wife said I would like a deck at the bottom of the garden to catch the evening sun the plan was hatched – well she never said it couldn’t be attached to a boat did she! Sylvia as she is known adds to Phil’s garden constructions which includes a Tiki Hut with heater and projection screen, a Caribbean Bar and board walk to a boat house. “We are now in the position for us to get on the boat, take in a glass of champagne and then before you know it we have arrived at the Caribbean Bar” Now that’s our idea of plain sailing!